SLATY CREEK, Friday.- "Back to Slaty Creek" celebrations this afternoon attracted a large crowd of visitors, including the Minister for Education (Mr. Pennington). In a speech Mr. Pennington said that last year he was allotted £ 8,000 to spend among 2,750 schools, but this year the amount had been increased to £100,000. Already 75 per cent, of it had been spent. Mothers' clubs were doing splendid work, especially in industrial suburbs. In the Werribee district there were 100 scholars, and 50 more coming on, and the department could not even provide a building for them. The department wanted to build a school, but the people wanted £70 an acre for land. 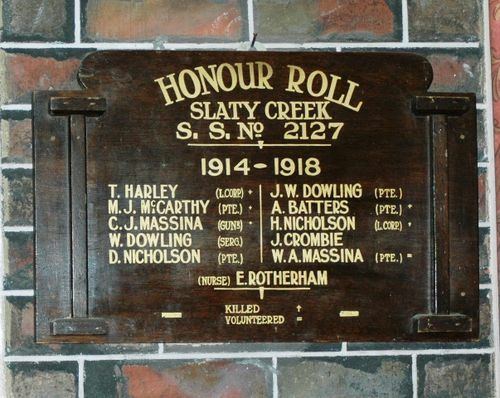 In unveiling an honour-board at the Slaty Creek State school, Mr. Pennington said that of those who enlisted from Slaty Creek, 50 per cent, made the supreme sacrifice. This was the largest number of deaths he knew of from any one school in the State. Argus (Melbourne), 6 October 1934.